This is an engaging and thoroughly well-thought out book that will help teachers, parents, carers and children in understanding why some children struggle in school as a result of sometimes undiagnosed or unrecognised challenges. A short description of a sensory/motor condition precedes each story - the challenges faced described through a variety of dinosaur characters. The story is followed up with a worksheet for the child and supporting adult to work through, and there are practical strategies recommended for both school and home. 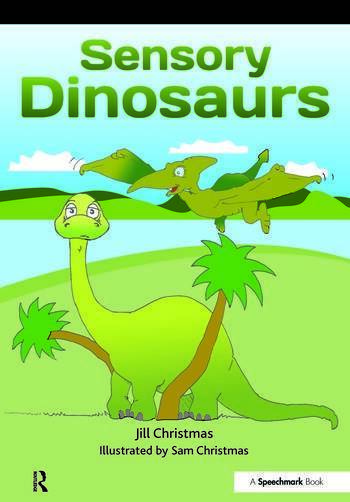 Each dinosaur has a different sensory condition, for example, Terri-dactyl who is afraid of heights and flying because his balance system is very sensitive and he can't join in with his friends because of his difficulties. Other dinosaurs and their conditions include: Developmental Coordination Disorder; Dyspraxia/proprioception; Sensory processing/Sensory Integration Disorder; Asperger's syndrome; Self Esteem Issues; Joint hypermobility; Dyslexia; and, Balance difficulties. The strategies are advisory only but simple and practical enough to be incorporated within a school or home setting with the minimum of cost. "Sensory Dinosaurs" provides an excellent platform for positive participation by the child in exploring the challenges they personally experience.